The most beautiful markets in the world Archi-new - Free Dwg file Blocks Cad autocad architecture. Archi-new 3D Dwg - Free Dwg file Blocks Cad autocad architecture. More than these quotidian pleasures, covered markets are often special buildings, lovingly designed because their role – feeding the city and doing so deliciously and well – is equally as important as those of city halls and places of worship. Despite the apparently relentless rise of factory food and supermarkets, covered markets continue to thrive, some in bright patches of Britain and the United States. 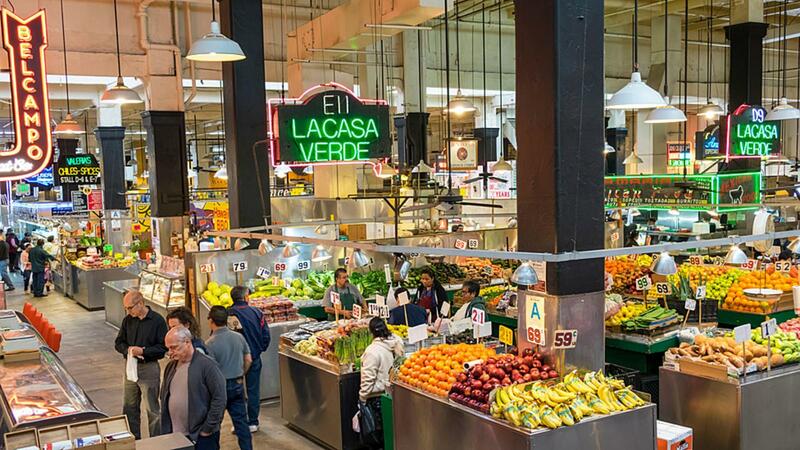 One of the surprising joys of downtown Los Angeles – a city most visitors think of as one great freeway where no-one even thinks of walking – is Grand Central Market on South Broadway. Opened in 1917 on the ground floor of the Homer Loughlin Building and designed by the English-born architect John B Parkinson, the market has served succeeding generations of immigrants. 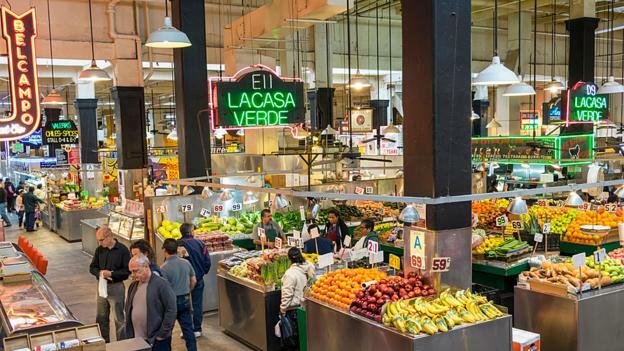 Today, 80% of those who shop here daily are Hispanic Americans, a fact reflected in the wealth of fresh fruit, vegetables and Spanish delis. Most of these, though, display their wares under all-American neon signs hung from the reinforced concrete beams of an innovative building where Frank Lloyd Wright, the most famous of all US architects, once ran his studio. The architecture of Seattle’s Pike Place Market is a rambling affair in a number of different styles dating from 1907, when this waterfront enterprise first opened. Located on several hillside levels, the nine-acre (3,600 sq m) market offers everything from the freshest Pacific fish to local crafts. A publicly owned development, it houses some 500 people as well as feeding and delighting many more. Of course you can dine on sushi here, although in its early days and before Congress passed an act in 1942 sending them to internment camps for the duration of the Second World War, Japanese-American families had made their special mark here, owning at least 80% of the market stalls. Pike Place Market thrives today, a city centre alternative to a world of manufactured food and heavily marketed retailing. If you’re lucky, you will even see – hard to miss him – Sol ‘The Cod Father’ Amon, Pike Place’s longest serving stall holder and a Seattle legend, outside Pure Food & Fish. Market buildings and big characters have long gone hand in hand. 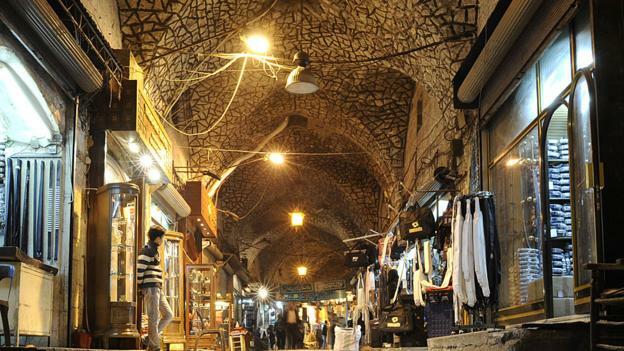 For sheer architectural beauty, Europe and the Middle East offer the finest of all covered markets. Despite intense competition from opulent palazzos and mesmerising art-laced churches, few visitors to Venice can fail to be impressed by the Pescheria, the covered fish market set cheek-by-gill with Rialto Bridge. A fish market has existed near here since 1097, although the existing Neo-Gothic building designed by architect Domenico Rupolo and painter Cesare Laurenti dates from 1907. Look up at the capitals crowning the columns supporting the roof: they sport fish heads rather than classically correct volutes or acanthus leaves. Competing for artistry, however, are the displays of fresh food on offer, here and in the next-door Erberia or fruit and vegetable market. The market is best approached by thetraghetto – gondola ferry – from Santa Sofia on the other side of the Grand Canal. This way, the worlds of fish, water, boats, a very grand canal, a particular cuisine and unforgettable piscine architecture are caught in one distinctive Venetian net. These Italian and US markets are particular as well as special. 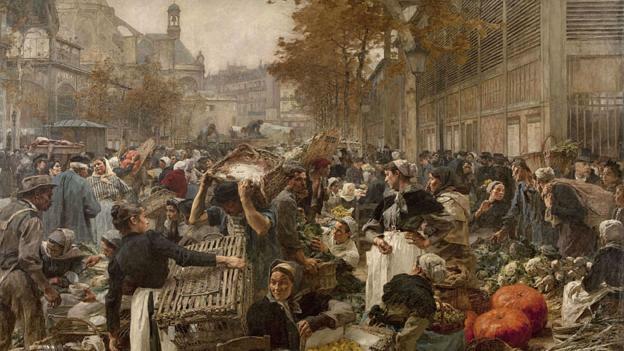 Paris, on the other hand, has a long tradition of everyday covered markets throughout the city. These are the children of the great central mother market, Les Halles – the ‘Belly of Paris’, its name adopted from the title of Emile Zola’s 1873 novel, Le Ventre de Paris, although this mid-19th Century Crystal Palace of food, designed by the City Architect Victor Baltard, was demolished in 1971. Of the thirteen surviving covered markets, Marché La Chapelle, by Baltard in the 18th arrondisement, has been well restored. It gives a hint of what the much missed Les Halles was like, while offering food from Portugal and North Africa and the sight of busy local shoppers who use this and other Parisian markets daily. These French markets were elegant, yet matter-of-fact designs. What was sold here was ultimately more important than the architecture. 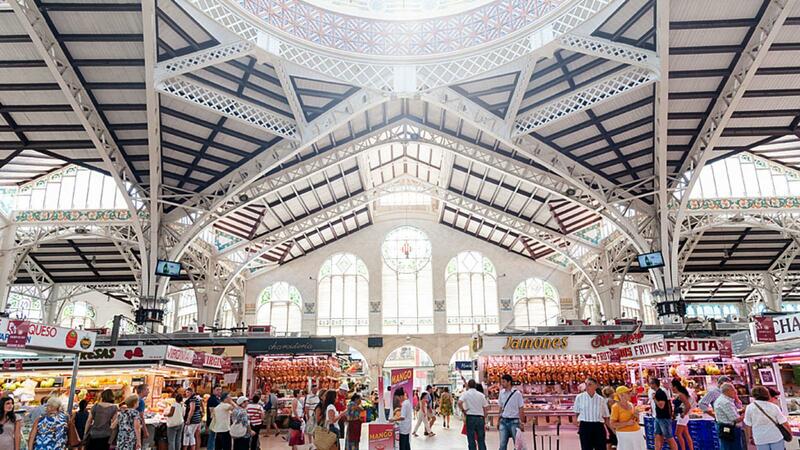 This cannot be said of Valencia’s Mercado Central, an apotheosis of the covered market as urban artwork. Happily, the food on sale in this exquisite Spanish Art Nouveau building is as every bit delicious as the enveloping architecture. Designed by the Catalan architects Francisco Guardia and Alejandro Soler, the market, with its spectacular domes, colourful ceramics, mosaics and stained glass, was completed in 1928. Today, it boasts a thousand stalls groaning with glorious food. Those brought up on supermarkets can only stare in wonder, and eat in amazement; this is what fresh food can be, and it is for everyone, every day at no extra cost. The greatest of all covered markets, in terms of scale and magnificence, are those of the Middle East. Tragically, the best of all, the Al-Madina Souq in the heart of Aleppo, its structure dating back to at least 1450, has been badly damaged in the current Syrian conflict. Here, there are eight miles of covered streets, many leading under noble stone vaults. A place of shadows playing in sunlight, of thousands of stalls laden with food, spices and fabrics, this was for many centuries one of the great melting pots of religions and cultures. Hopefully, it will be restored to its former glory. In Rotterdam, meanwhile, a famously tolerant city where peoples of many different cultures live, work and shop, an eye-catching, even audacious, new covered market has opened in the city’s Laurens district. This large and colourful horseshoe-shaped building, by MVDRV architects, embraces food and flower stalls, hip new fashion boutiques, bright apartments and new business enterprises. It even includes a cookery school for those challenged by what to do with real, fresh food. The Markthal’s lively architectural presence makes it clear that the covered market is not just here to stay, but also that it has a future more enticing and pleasurable than any edge-of-town supermarket is ever likely to be, from here to Los Angeles.